Excellent reasonably priced all inclusive Hotel. Super staff and comfortable rooms. would happily go again. Outpriced from previous vsits to Escape and Spa, now Waves, and super alternative. Second time at this hotel, gets better every time! Friendly staff, clean and tidy rooms, will be going back and would highly recommend to families! Barbados is a great place for a relaxing holiday. Barbados is a Caribbean island with great sandy beaches, friendly people and bustling towns with lively nightlife. If you are planning a romantic getaway or family holiday then The Travellers Guide has a great choice of hotels in Barbados to suit all budgets. Good value, family friendly hotels, luxury all inclusive hotels and 4 and 5 star spa hotels are listed below. The main international airport in Barbados is Barbados Grantley Adams International Airport (BGI). Virgin Atlantic, BA, Thomson and Expedia have flights from Gatwick (LGW), Birmingham (BHX), Manchester (MAN) and East Midlands (EMA) to Barbados (BGI). Please view our Barbados hotel offers page for the latest "early booking", "spa offers", "all inclusive deals", "percentage discount" and "dinner, bed and breakfast" special offers for a range of hotels, guest houses, bed & breakfast and self catering accommodation in Barbados and in the rest of the Caribbean. Barbados has a warm and sunny climate year round with average daytime highs of 75 - 85 F. Barbados has prevailing northeast tradewinds so that although the weather is bright and sunny, it does not get unbearably hot. Barbados rainfall usually comes in quick, heavy showers. Barbados dry season lasts from January to June. Access to Virgin v-room (airport lounge): at London Gatwick Airport (LGW), and Manchester Airport (MAN). Virgin Holidays have a free one day duty-free shopping shuttle to Bridgetown, Barbados from their hotels. What time is it in Barbados? The current time in Barbados is GMT - 4 hours. Waves Hotel, Barbados (previously called Escape at Prospect Bay) has been recently refurbished and is a 4 star all inclusive hotel with swimming pool, spa and its own private beach. 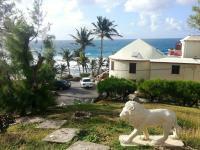 Waves Hotel is on the West Coast, in St James, 10 min north of Bridgetown. Located within the famous Royal Westmoreland Resort, this luxury villa features a private pool and sun deck with golf course views. Guests enjoy free access to resort facilities. With a peaceful, beachfront location, Cobblers Cove is set in exotic gardens and offers free watersports, including windsurfing, sailing and waterskiing. Each air conditioned suite features a private balcony or terrace. South Beach Hotel is located in front of Accra Beach in the south coast of Barbados and 1 km from the Graeme Hall Nature Sanctuary. It features an outdoor swimming pool and a 24-hour front desk. This resort-style hotel is less than a 5-minute's walk from the beach and the beautiful Caribbean Sea. It boasts an outdoor pool, an on-site restaurant and sports bar, and free Wi-Fi. 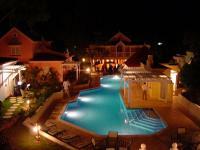 Set on Rockley Beach, Accra Beach Hotel offers an outdoor pool, spa, game room, kids club and gym. The air-conditioned rooms feature free Wi-Fi and a balcony with views of the island, pool or sea. Situated right on the beach, this hotel is bordered by the Graeme Hall Nature Sanctuary on the south coast of Barbadoes. Cocktails are served throughout the day beside the freshwater swimming pool.